Too often we look to celebrities from the world of sports, entertainment or business as our heroes. The problem is, these famous folks appear larger-than-life, so we don’t really believe we can achieve the same level of success. And then there are the everyday heroes. Personally, I find them much more inspiring than the ones whose names are often in the headlines. I can identify with them more readily. Gisela Hausmann is such a person. 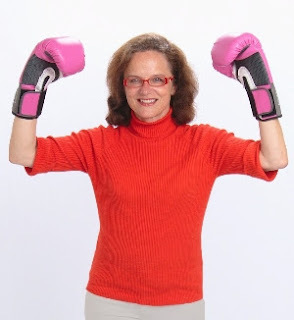 After reading her remarkable book, Naked Determination: Forty-one Spirited Tales for Fearless, Motivated Underdogs, I felt I had made a new friend and learned important lessons I could apply to my own life. The title alone tells you a lot about her. Being pushed off the high dive by a bully at age 6 when she couldn't swim and figuring how to survive. Standing up to that same bully (and winning) at age 8 to defend her brother. Later, teaching herself to use a chainsaw. Grabbing the opportunity to get within four feet of Mihkail Gorbachev and take his picture. Traveling to exotic locations that most people have never even heard of, like Lhasa, Zanskar and Ladakh. 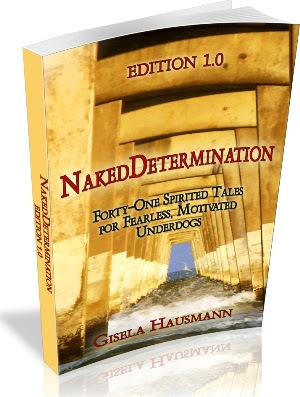 Each chapter stimulated me to think about situations in my own life where I had used – or failed to use – the strengths that Gisela has come to engage at will, like courage, boldness and determination. The structure she employs makes it easy for us as the readers to do this. Each chapter ends with her own insights about the lessons she took away from a specific situation. Then we are left to draw conclusions about applying the ideas in our own life. 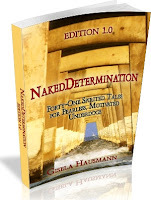 If you enjoy memorable, real stories delivered in bite-sized chunks by a talented, engaging writer, you will love Naked Determination. It’s a book I’ll go back to whenever I want to remind myself what’s possible for any human being with the drive, grit and tenacity to succeed in life. I highly recommend it.